WOW! We can’t believe it. This month Common Digs Forest School turns five years old! Five years of growing! February 2014 we started out with a group of four children. Forest School was essentially unknown at that time. 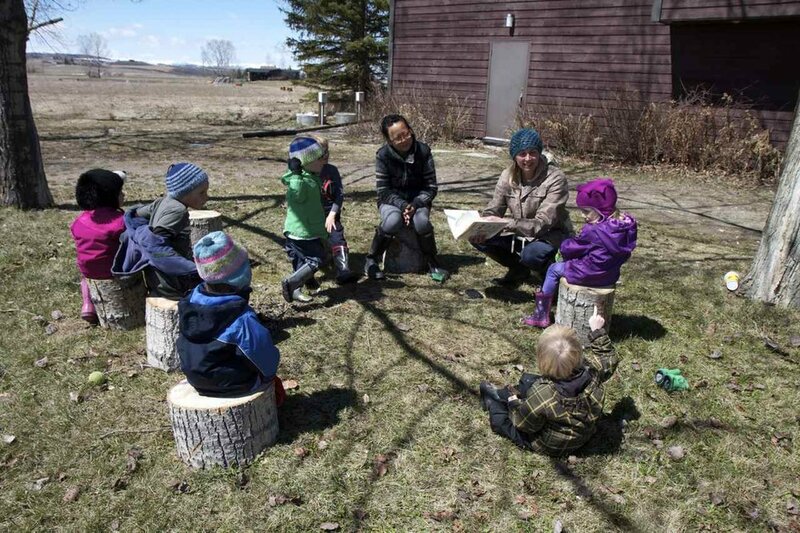 Forest School Canada had just started up and Lisa had taken the first pilot Forest School Practitioner course. We questioned if we would ever get enough children to commit to running Forest School full time. We remember when we have our first open house and all of the parents could sit on one picnic blanket! Now we are in disbelief that over 500 children have participated in our programs. Launching Forest School - Of course bringing Forest School to the Calgary and area communities has been a highlight of the last five years and with that helping to launch Children’s Commons Ecological Society and Calgary Nature Kindergarten to bring programming to more families and bring the forest school philosophy into the educational system. Jon Cree from the Forest School Association in the UK once told us that you don’t need a forest to run Forest School but a few trees is nice. The children in the inner city programs have taught us that this holds true - a rich and deep awareness and connection to the environment can be cultivated anywhere, when given the time and access. Working in a pilot program urban farming with teens and young adults with autism in partnership with Janus Academy - We have always believed deeply in the benefits of connecting to nature for people of all abilities. Although this program only ran one year, our time and energy taken by Forest School, it deepened our belief of how empowering it is for people of all abilities to grow their own food and know their food from seed to table. What we gave to that program has given back to us even more that we still carry in our hearts today. This group taught us to slow down, to savour in the experience. To lay back in the grass and laugh without inhibition after a hard day of work and the value of smelling a seed and not only the flowers. These young people taught us how to listening even when sometimes someone has no voice. They have in many ways been our greatest teachers and better prepared us to work with young children with greater sensitivity. Meeting and supporting Teachers and Early Childcare Educators through workshops and public speaking - We have been blessed to have the Calgary (and Alberta) community of educators reach out to us to learn about what Forest School is about and ways they might incorporate a small piece of forest school and more outdoor play into their schools and centres. We were so very privileged to be chosen as speakers at the International Play Conference in 2017 and will never forget the powerful experience that transpired when our group of young forest schoolers led the adults in a session on large-scale loose parts play - reminding us that the children themselves tell the story best. Up-scaling and down-scaling - We made an intentional decision at the beginning of this journey to grow the organization organically, leading with our hearts. Through this we have experienced and tested many different locations throughout the city as the opportunities presented themselves. We ran two sites for a couple of years and then made the difficult decision to temporarily return to one site to build up our organization from within. In many ways, it has been a very personal journey, but one we’ve tried to stay true to making the work both meaningful and intentional and coming to the realization that our truest measure of success has been the growth within ourselves. Growing a team and community we love - A community beginning with parents who have shared with their friends about the programs or helped us to find land to run programs and have entrusted their children to our programs. Industry advocates who generously shared our name with their peers, and educators who have reached out to us and come to workshops. Past and present educators who have showed up everyday with curiosity, a love for nature and for learning with children and have been so willing to learn, to question, to teach and to walk alongside us on this path. The children, whom we learn from each and every day. And finally, to our own families who have given us courage and the freedom to undergo this journey, even when it meant that we weren’t always as available to them as much as we wanted to be. Through all of this, we have learned that it is not so much us that have grown a community but the community that has grown us. We are so grateful for all of the community support, we would not be celebrating today if it weren’t for you. Thank you all so very much. We look forward to the next five years! P.S. We have many birthday wishes and hopes for the future. Some wishes are still hush (we aren’t quite ready to share yet but are super excited about!). Others we will be announcing very soon! Make sure you don’t miss out on them – sign up to our newsletter here. Subscribe to our newsletter to stay connected to the Common Digs community and all of its’ happenings! You’ll receive advance notice about upcoming events, workshops, new programming and some behind-the-scenes news from Common Digs. We won’t commit ourselves to emailing newsletters frequently or even regularly (we’ve learned not to do that!) just often enough to share with you news that we think and hope you will enjoy! If you have a birthday wish for us, we would so love to hear it! Please put it in the comments below!